One of the best things about the outdoors is that it’s there for everyone, free of charge, any time of year, and La Crosse, WI, is the heart of the one of the Midwest’s most naturally beautiful areas. Opportunities for enjoying the natural world abound, providing some of the best ways to plan activities on a budget. Several area businesses and organizations also offer free activities and promotions, creating unique opportunities for family-friendly outings. 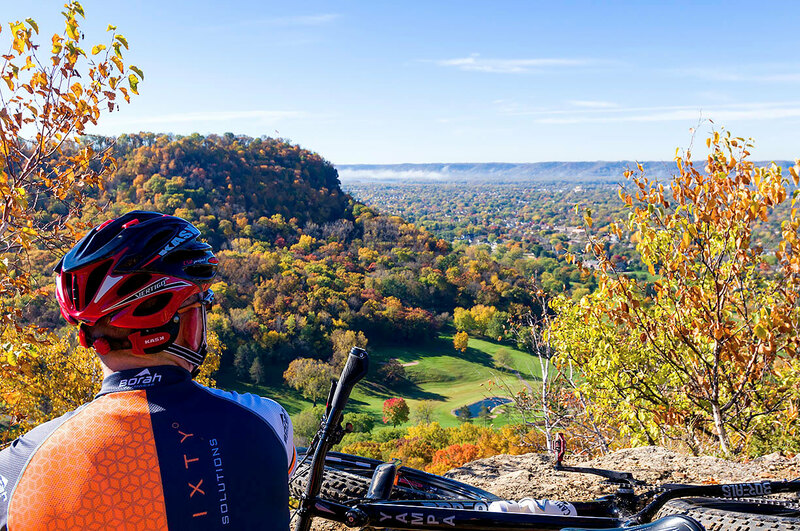 La Crosse, Wisconsin’s, picturesque bluffs and riverlands and quiet county highways make for some of the best road and mountain biking in the world. Over 100 miles of highly maintained bike paths and trails cover the region, and the City of La Crosse has achieved the Silver-level designation as a Bicycle Friendly Community, with miles of designated bike lanes, bikeways well-marked by sharrows (shared-lane markings) and more bicycle friendly businesses per capita than any other city in Wisconsin. City road maps showing designated bike routes detailing can viewed at the City of La Crosse website, and theWisconsin Bike Federation sells maps detailing the rideability of Wisconsin’s state and county highways. And be sure to check out our Bicycling in the Driftless Region page, with maps and information on 11 self-supported road rides right here in the La Crosse area. There might not be a better place in the world to explore on foot than La Crosse, WI. With wooded bluffs topped by craggy sandstone outcroppings, vast marshes teeming with wildlife, pristine prairies and meadows, and rivers, lakes, and streams everywhere you turn, there’s a whole world to explore in this quiet little corner of the Upper Midwest. And with hundreds of miles of designated, well-maintained trails, you won’t need a compass to do it! Whether you prefer leisurely strolls along wide, level paths, or heart-pounding climbs up steep, rocky trails, you’ll find your hike in La Crosse. With over 1400 acres across nearly 50 parks, La Crosse offers public space of every kind, from forested hiking and scenic viewpoints to swimming pools, picnic facilities, and playgrounds. Check out the amazing views from Grandad Bluff, enjoy the action on the water from Black River Beach, cool off at Erickson Pool, or hit the ice at Green Island Park & Ice Arena . . . La Crosse’s parks have it all! Featuring everything from local favorites to some of the biggest names in show business, La Crosse’s live music scene has something for everyone. Find blues and lounge music, bluegrass and country western, pop and rock, all in big concert venues, hole-in-the-wall taverns, or fine-dining establishments–the nightlife in La Crosse is not to be missed!